On this page you will find information about how best to prepare for the winter weather to keep your motorhome in tip top condition and prevent any frozen pipes. 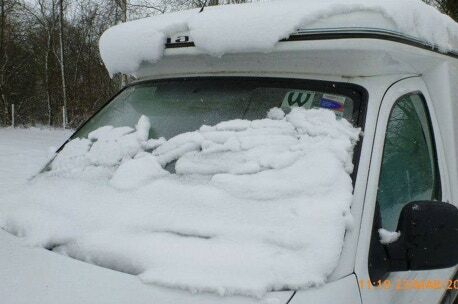 When you are not using your motorhome during the winter months you will need to take certain measures to prevent damage due to frost and bad weather, below are some tips taken from posts made by seasoned campers and experts on the small motorhome forum. Empty the fresh water tank - Open all the taps, not forgetting the toilet/bathroom compartment if you have one and let the water go into the waste tank, when the tank has emptied leave the taps open and switch off the pump. If you can take off the taps disconnect them and give them a good shake to get rid of any surplus water which can be left in resulting in the tap splitting along the seam when the water freezes. Drain the waste - You probably do this after every trip anyway but if you have a waste tank it will need to be drained to prevent freezing. Stand the van on level ground and open the waste tank, allow to drain fully and leave the tap open. Drain the fresh water tank - There may be a drain tap on your fresh water tank you will need to open this fully to get any remaining water out of the tank, leave the tap open. If your tank is inside the van (e.g. Romahome Duo), take off the inspection cap and get the remaining water out using a towel or similar. Drain the water heater - There should be a tap to drain the water heater, this is very important open the tap or valve and leave it open even when the water has drained out. If the water heater isn&apos;t drained it can freeze and cause expensive damage to the heater. Drain the cassette toilet flush - If you have a cassette toilet you will need to drain the flush tank, if it hasn&apos;t got a drain tap then flush the toilet until the tank is empty and then empty the cassette. Insulate the pump - The pump sometimes retains water but it is difficult to get it out without a lot of trouble so its a good idea to wrap the pump up to insulate it against the frost. Clean the inside of the van - This is important especially removing any traces of food there may be, even the smallest crumb can attract vermin that have been known to find refuge from the winter weather in motorhomes. Clean and disinfect the fridge and leave the door ajar. Window and door seals - Smear a thin film of vaseline on all your window and door seals to keep them in good condition during your winter lay up. Lastly have a drive round for a few miles - Have good drive round up and down hills round left and right hand corners etc., this will force all the water out of the tanks so that non remains to freeze also drive or run the engine during the winter to keep the batteries fully charged to prevent them freezing. Running the engine until the fans cut in is ideal but can take forever on a very cold day. A 10 mile drive will both charge batteries and remove any water from the oil.